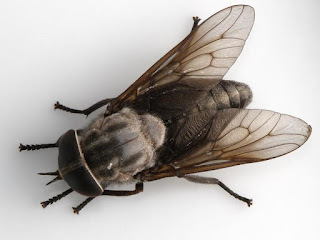 Time for another creature that most of us detest, but has some interesting information when it comes to creation and evolution: horseflies (or horse-flies). "Why do they call them horseflies, Cowboy Bob? They're nowhere near as big as a horse." "Fallacy of ambiguity on the words horse and hoarse." Good call, you're learning. Horseflies got their name because they bother horses. And livestock. And humans. 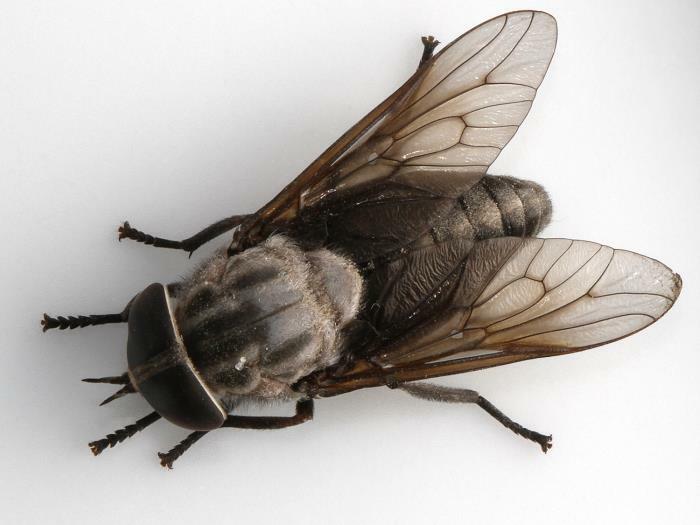 Like mosquitoes, the female horsefly bites to get blood. Since this nasty thing is indiscriminate and persistent in its painful biting, it also can spread disease, so you should treat the bites. (They're sometimes called gadflies because of their annoyance, much like some anti-creationists I could name.) Don't be expecting to pull up stakes to escape them, since they're on most of the planet. Over yonder in southeast Africa, the larvae burrow into the mud. But mud dries, so how can the unpleasant thing survive? By making a chamber around itself. Apparently, this behavior is unique. While creationists say that the Designer equipped them with this ability, evolutionist nature worshipers are giving credit to their god of evolution, which has apparently chosen to bestow this method of survival upon the horsefly. Hail Darwin, blessed be! AUGUST, 1929: in the sun-baked southeast African territory of Nyasaland (now called Malawi) medical entomologist (insect specialist) W.A. Lamborn discovered an extraordinary behaviour of the larva of the horsefly, genus Tabanus. He wrote a detailed description, and sent specimens, to his long-time friend E.B. Poulton, an Oxford University professor and fellow of the British Royal Society. Poulton judged ‘this elaborate adaptation’ in the larva of a fly to be ‘so remarkable and novel’ as to warrant immediate communication to the Royal Society, which published Lamborn’s findings in one of its scientific journals in early 1930. Years later, George McGavin, a well-known Oxford entomology professor, came across the story. He described the unusual behaviour of Tabanus as an ‘ingenious trick’ which, he said, ‘is literally unique to this one genus of horsefly’. To read the rest, buzz on over to "Bypassing the cracks — An amazing evolution-defying design in a tiny insect".